During the last academic year, staff and students raised money for The Christie’s Teenage and Young Adult Unit. We are delighted to announce that we exceeded our £4,000 target and presented The Christie with a cheque for £5,260.43! For our efforts, we have been awarded a donor coin at The Christie. There were a number of charity events held in and out of school last year from Strictly Come Dancing to Catwalk Challenges, bag packing at supermarkets to collections at Manchester City Football Club and non-uniform days. All events big and small have contributed towards the final total of £5,260.43 for The Christie. Last year we also supported the Wear it Pink and Festive Jumper days as well as Children In Need and Asthma UK. For all charity events in school last academic year, we raised a grand total of £6,867.60. 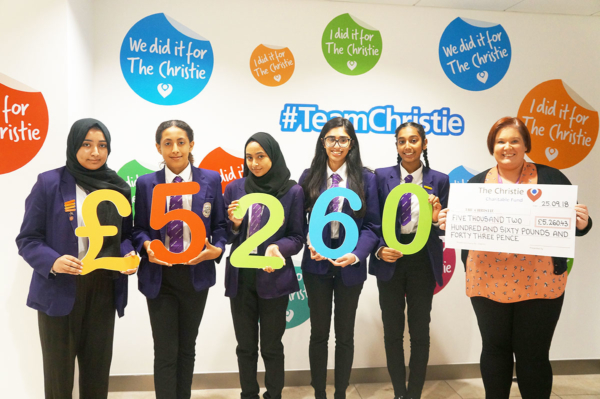 Charity is something that both students and staff at Whalley Range are extremely passionate about, to raise £5,260.43 for The Christie is amazing and I would like to say a huge thank you to everyone for their support. This money will help to provide complementary therapists, take patients out on trips, buy resources and make a young person’s stay in hospital more bearable during gruelling treatment. I would also like to thank The Christie for all their support this year. I am so proud of our final charity total of £6,867.60. Each and every student and member of staff who has contributed towards this final total should be proud of the overwhelmingly positive impact and change they’ve brought to people’s lives.